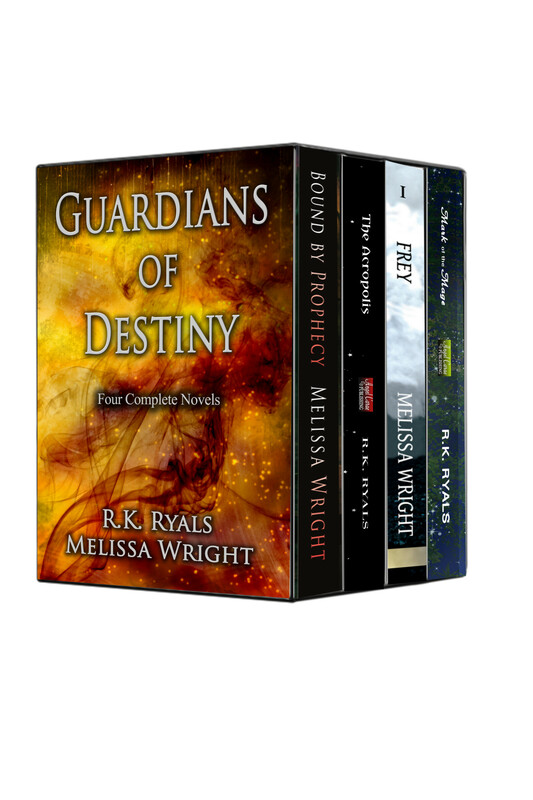 Amazon bestselling authors Melissa Wright and R.K. Ryals has teamed up to release a box set of four of their full length fantasy firsts. plans of their own, and it’s the last thing Aern is willing to do. Brianna isn’t the only one who’s in danger. These words are not comforting to me. At eighteen, I am a gargoyle who has been demoted because I broke the rules. Now I have a new mission, a new mark to protect. But I don’t expect Emma Chase. I don’t expect to question my own race. I don’t expect to care for my own mark. And I am not prepared for what I find at The Acropolis. Unaware she’s been bound from using magic, Frey leads a small, miserable life in the village where she’s sent after the death of her mother. But a tiny spark starts a fury of changes and she finds herself running from everything she’s ever known. Hunted by council for practicing dark magic, she is certain she’s been wrongfully accused. She flees, and is forced to rely on strangers for protection. But the farther she strays from home, the more her magic and forgotten memories return and she begins to suspect all is not as it seems. Books never die, but they can be forbidden. Medeisia is a country in turmoil ruled by a blood thirsty king who has outlawed the use of magic and anything pertaining to knowledge. Magery and scribery are forbidden. All who practice are marked with a tattoo branded onto their wrists, their futures precarious. thrust into a harsh world where the marked must survive or die.